You can read or listen to our modules. There is a play button in each heading so you can listen while you read. Or you can listen to the whole module in one go or download it as a podcast. You'll find a play and download button for the whole module at the bottom of this page. At the end of the module there is a quiz. You will have to hit the play button on the quiz video and enter your name and email address before you start. Tea tree oil is an essential oil that is extracted from the leaves and small branches of the tea tree, Melaleuca alternifolia, a native of Australia. Another name for tea tree oil is melaleuca oil. The oil is a colourless or pale yellow liquid with a 'medicinal' smell. It contains over 100 compounds, including terpenes and alcohols. Use of the extracted oil of the plant rather than the plant material itself, started back in the 1930s. The pure oil is readily available in ‘health food’ shops, usually in 10mL opaque bottles with a dropper top. Tea tree oil is an ingredient in numerous products for pets, including shampoos, creams, lotions, insect repellents and ear cleaners. None are licensed as medicines in the UK. In laboratory experiments tea tree oil has been shown to have antibacterial, antifungal, antiviral, antiprotozoal and anti-inflammatory effects. Some people use tree oil because they perceive it as a ‘natural’ or ‘non-chemical’ treatment. But there is a lack of evidence that it has any beneficial effects in treating disorders or in controlling fleas in pets. And the natural chemicals in tea tree oil and other essential oils can cause harms and can be dangerous for pets. Tea tree oil can irritate the skin causing redness, itching and rash. If pure tea tree oil is applied to a pet's skin it will quickly be absorbed into the body, either directly across the skin, or from the stomach if the animal has licked its skin while grooming. Even if the pure oil is diluted before being applied it may be ingested by the animal through grooming, and cause toxicity. Cats may be more likely than dogs to have toxicity because of their grooming behaviour. The natural chemicals in tea tree oil can cause serious toxicity to pets, including death. Proprietary products containing low concentrations of tea tree oil that are intended for use on the skin or fur in small amounts would not be expected to cause toxicity. The signs of toxicity can occur within 2–8 hours of application of tea tree oil to the skin. The animal's breath, urine, faeces and any vomited stomach contents may smell strongly of the oil. The animal might have weakness, tremors, odd movements, behavioural disorders and depression. Recovery often occurs within 24 hours, but can take longer. In severe cases, the animal may collapse, go into a coma or have convulsions. There is very limited information on the use of tea tree oil in the treatment of disorders in pets and so the benefits are uncertain. There is no evidence that tea tree oil is effective in controlling fleas. Pure essential oils, including tea tree oil (even if diluted), should never be used on pets, either given by mouth or applied to the skin or fur. Deaths have been reported in pets after application of tea tree oil to the skin or fur. Any pure essential oil on the skin should be washed off promptly with detergent and water. If the animal becomes unwell, immediately contact a vet or the Animal Poison Line. Pure essential oils should be stored safely out of sight, and out of reach of pets and children. The lid should be replaced securely, and any drips down the side of the bottle cleaned. ‘Natural’ does not mean safe. You can listen to a complete podcast of the module by pressing the play button below or use the download link on the right hand side of the player to download the podcast to your mobile device. To do the CPD quiz and receive your certificate, you will have to hit the play button below and enter your name and email address before you start. Bischoff K, Guale F. Australian tea tree (Melaleuca alternifolia) oil poisoning in three purebred cats. J Vet Diagn Invest 1998; 10(2): 208-10. Carson CF et al. Melaleuca alternifolia (Tea Tree) oil: a review of antimicrobial and other medicinal properties. Clin Microbiol Rev 2006; 19(1): 50-62.
de Groot A, Schmidt E. Tea tree oil: contact allergy and chemical composition. Contact Dermatitis 2016; 75(3): 129-43. Genovese AG et al. Adverse reactions from essential oil-containing natural flea products exempted from Environmental Protection Agency regulations in dogs and cats. J Vet Emerg Crit Care 2012; 22(4): 470-5. Kaluzienski M. Partial paralysis and altered behavior in dogs treated with melaleuca oil [abstract]. J Toxicol Clin Toxicol 2000; 38 (5):518-9. Khan SA et al. Concentrated tea tree oil toxicosis in dogs and cats: 443 cases (2002-2012). J Am Vet Med Assoc 2014; 244(1): 95-9. Kohlert C et al. Bioavailability and pharmacokinetics of natural volatile terpenes in animals and humans. Planta Med 2000; 66(6): 495-505. Natural Medicines Comprehensive Database [Internet]. Tea tree oil monograph. Stockton: Therapeutic Research Faculty. Cited 31 July 2016. Available from naturaldatabase.therapeuticsresearch.com. Norris J. 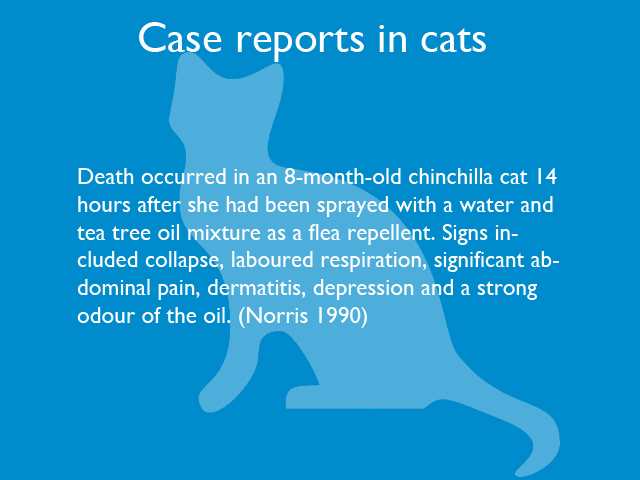 Tea tree oil poisoning in a cat. Control Ther Series 1990; 157: 270. Scientific Committee on Consumer Products (SCCP). Minutes 18th plenary meeting of the SCCP of 16 December 2008 (SCCP/1194/08). Opinion on tea tree oil (SCCP/1155/08). Thornton M. Tea tree oil poisoning: possible case. Control Ther Series 1990; 153: 206. Villar D et al. Toxicity of melaleuca oil and related essential oils applied topically on dogs and cats. Vet Human Toxicol 1994; 36 (2): 139-42. Wismer T, Means C. Toxicology of newer insecticides in small animals. Vet Clin Small Anim 2012; 42: 335-47.